I have a huge backlog of projects to share with you -- some even from last year! 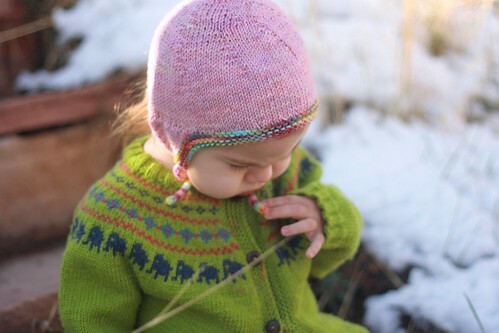 Today I wanted to start off with this sweet little cap that I knitted for Fiona at the end of January. Fiona was really in need of a new hat this winter (she actually didn't have one that fit, or that she would leave on). I didn't find a pattern I liked until a friend told me about this one, which was designed by a friend of hers. I was excited to knit it up because it was just what I was looking for: in a DK weight yarn, with earflaps, and under-chin ties. 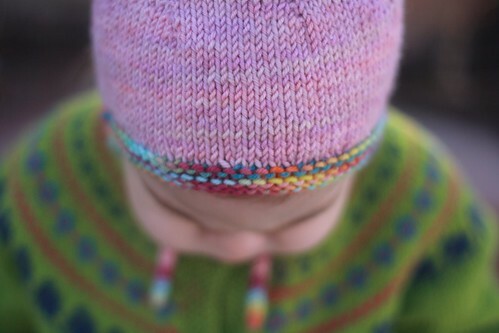 It's the Junie Cap (that's a ravelry link). It is such a cute little design. 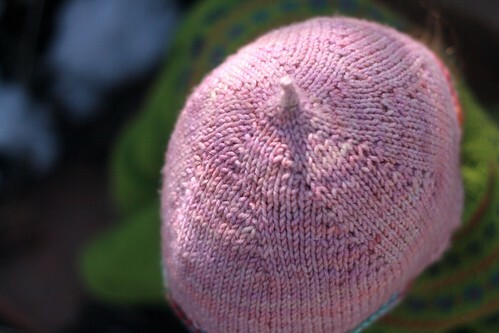 It's knit from the top down, which I love (as you know), and the short-row earflaps are a brilliant design detail. 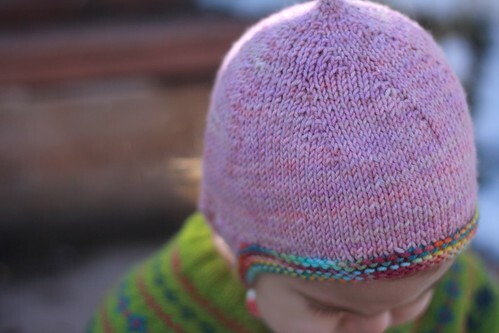 The little pointy top (achieved by knitting a few rows of i-cord from the cast-on, rather than starting in on crown shaping right away) is a cute, playful addition. It knitted up quickly, which was a good thing since I ended up ripping it out after completing it the first time. 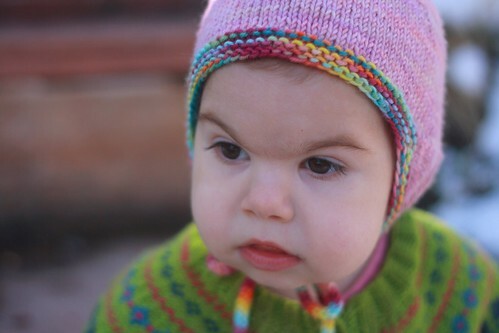 The first time I knitted it, in the 18-month size, it turned out huge. It actually fit me! This was partly because of my gauge (it was a bit loose, although I had swatched, so that was too bad), and partly because our family have tiny heads, and partly, I think, because the pattern runs a bit big. The pattern doesn't give finished measurements, only age ranges, so that is just a guess; but I think it must run at least somewhat big since my gauge and our tiny heads can only account for part of the reason it came out so big. Anyway, you might start with a size smaller than you think you need unless you know your children have good-sized heads. The second time around, I knit the 3-6-month size (without changing needle size or yarn, so I was still on the slightly big gauge), and it fits Fiona perfectly. The yarn I used was Blue Moon Fiber Arts Socks that Rock heavyweight; this was the first time I'd used this yarn and I have to say that I really love it. The texture is beautiful. 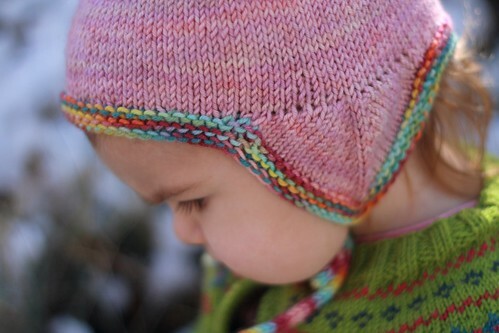 It's wonderfully soft without being fuzzy or cloying, and the colors are complex and beautiful. Overall, a very satisfying knit: fantastic yarn, a quick pattern, cute results. 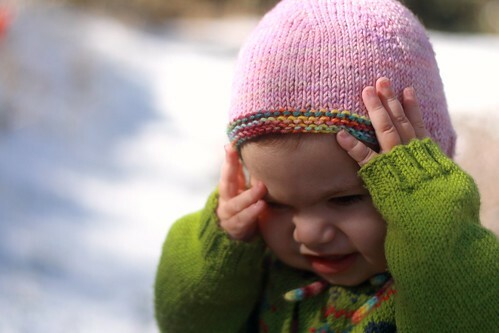 We'll still get quite a bit of use out of the cap this spring, and during camping trips in the summer. I love when projects are so satisfying!